The club's Annual Meeting will be held on June 30th at the Philadelphia Airport Embassy Suites Hotel. Our Speaker will be Ms. Amy Smith, course II S.B. '84, M.S. '95 and currently an Instructor at the Edgerton Center and a lecturer in the Department of Mechanical Engineering. The meeting will start at 6 PM with a cash bar until 7. A buffet dinner will be served, $35 for members and their guests, $40 for non-members. Ms. Smith's talk will commence at 8 PM, after the club holds a short business meeting where next year's club officers will be elected. The Embassy Suite is located at 9000 Bartram Ave. Philadelphia directions can be obtained from Mapquest www.mapquest.com or from the Embassy Suites at 215-365-4500. Register for the meeting by going to SmarTrans or by sending a check to: Dr. William Reenstra, 200 Garden Pl, Radnor PA 19087 by June 26th. In 1999, she won a Collegiate Inventors award for a phase-change incubator that allows bacteria to be cultured for clinical testing in areas where electricity is either unreliable or non-existent. 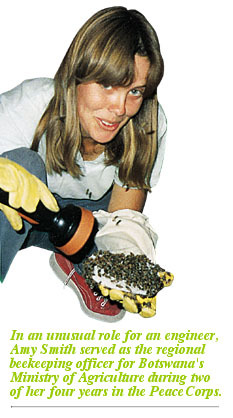 In 2000, Ms. Smith won the $30,000 Lemelson-MIT Student Prize for inventiveness. The panel selected Ms. Smith for her inspiring dedication to the application of mechanical engineering design skills for the invention of devices with appropriate technologies for use in developing countries. In 2001, Ms. Smith was a co-founder of the MIT Service Learning Initiative and the MIT IDEAS (Innovation Development Enterprise Action) competition at where students work with a community partner to solve a problem for the disenfranchised. Ms. Smith is also Founder and Program Coordinator for the Public Service Design Seminars, where she inspires students to develop technologies for third world peoples and to field test these technologies in places like Haiti, Brazil an India. Ms. Smith was a Peace Corp Volunteer in Botswana for 4years. While there, she learned firsthand how rural Africa women may spend 4 hours a day grinding grain. Mechanical harnmermills are highly sought after devices that can perform the same task in minutes. However, when they breakdown they cannot be locally repaired. Part of Amy Smith's work that was sited by the Lemelson Committee was her invention of a hammermill that could be repaired by a blacksmith. When field tested in Senegal the mill, created at one-fourth the cost of conventional mills, used less energy and produced a superior product. It is her hard won appreciation of the needs of third world peoples, understanding of engineering, and the dedication to their service that makes Amy Smith one of the most inspiring individuals at MIT. Click here to read the New York Times Article on her.